Surface bolts have a variety of uses. Generally, surface bolts are used on a set of double doors where one of the doors is inactive most of the time. 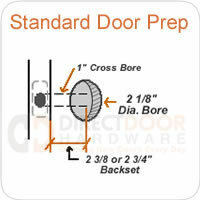 To hold the door closed a surface bolt can be installed on the top and bottom of the door. To hold the door securely you push the surface bolt into the strike plate (included) in the jamb, or on the floor. Surface bolts, like the name implies are mounted to the surface of the door which makes them easier to install than flush bolts that are often used and recessed into the edge of the door. Surface bolts are also used to hold dutch doors together, or as an additional security bolt mounted horizontally on a door. We have many styles of surface bolts available in finishes to coordinate with your existing or new door hardware. Using Surface Bolts on Double Doors. 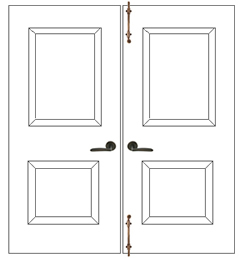 On double doors you generally will use a surface bolt on the top and the bottom of the inactive door as shown in the image to the left. The surface bolts themselves are easily surface mounted to the door. The strike plates that the bolt slides into (included) require a small hole to be drilled into the jamb or the floor. The strike plate provides a clean look, and holds the bolt securely from damaging the floor or jamb. Surface bolts have a cool, classic look and are easy to use. Surface bolts also come in several sizes. Depending on your height, and the height of your doors, you might consider a longer surface bolt mounted to the top of your door so that it is easier to reach when you want to open the door. You can also use a surface bolt on a dutch door as show here. The size of bolt you use is up to you, generally you would use a smaller size and place it just above the door knob or lever you have on the lower door. Once mounted you can attach the two door halves and open or close the door as one.